Continuing the treatise upon the manifestations and management of corrupting energies by the Traditions of Ambria and beyond – see Part 1 for matters concerning the Theurgy of Prios and those who dabble in Witchcraft. For the Sorcerer, Corruption is not a foe nor an obstacle; Corruption is an intimate, although dangerous, companion. The practice of sorcery does not seek to ward off or placate the powers of Corruption but to embrace them, and in so doing, Sorcerers walk a fine line between bending it to their will and losing themselves to the nightmarish energies. The Sorcerer perceives Corruption as a swirling, frigid, misty black veil of leering visages and subtle whispers. The powers therein coax and tease, beckon and promise; one moment permissive, the next utterly unyielding. It is the relationship between these forces and the Sorcerer that garners such potential, a continuous intimate, almost sultry, mediation teetering on the edge of disaster. The Sorcerer offers a bit of his own essence in each negotiation and in return is granted a token of the power he so jealously desires. It is a treacherous path but one the Sorcerer gladly embarks upon for not only are the gifts remarkable, but the thrill of victory intoxicating as well. So the deals are set, the contracts made but the bargaining never ends and in truth every Sorcerer understands it is a game they can never truly win. When the Sorcerer over extends and finds himself in debt to the powers to which he owes fealty, the payment is costly. Stigmas placed upon the Sorcerer are attuned to the vile energies in which he is immersed. Eyes become pits of cold blackness; veins spiderwebs of black across skin of pale parchment. The skin can become icy cold to the touch, the breath fetid. Some are stricken with a phlegmy cough, bouts of retching, or lesions that will not heal. For some their very blood turns viscous black and gives off a putrid stench if let. Dark dreams torment nearly all Sorcerers, hints of what they have witnessed in the dark surfacing through the mind’s desperate attempt to forget. Sleep is often broken by spasmodic thrashing, wails of terror, or mutterings in languages never meant for the human tongue. Even when awake such visions can plague the unwary, nudging them ever closer to the brink of insanity. For the Sorcerer to yield to the fiends abetting his practice is a slippery slope into a living nightmare. Recovery from the administrations of his insidious colleagues is a matter of reestablishing their mutual respect and regaining some small margin of safety. A few moments of solitude without interruption is often sufficient wherein the Sorcerer communes with the powers encircling him and through force of will and guile procures their retreat. To aid in this endeavor the Sorcerer might offer some small sacrifice; a bit of his own flesh, a token of hard won wealth or a sprig of some rare herb retrieved through danger or in darkness. Muttered incantations normally accompany these offerings, diabolic recitations spoken to strengthen the Sorcerer’s bond with those he entreats. For the Wizard magic is science; a carefully researched and applied trade involving the power of will, the properties of natural elements and a keen understanding of magical processes. The Wizard practices her art through carefully developed, learned and implemented formulary. Their perception of Corruption is no less analytical. To a learned Wizard, Corruption is simply the natural bi-product of and a growing impedance to the manipulation of mystical energies. It is as void of personal intent, and as unavoidable, as pull of the world upon one’s feet or the heat of an open flame but no less dangerous in its fundamental detachment and neutrality. A Wizard perceives the intensification of Corruption as a something akin to a dark static charge that reacts to any stimulation. At its least the charge merely resists but as it grows it can strike out at the source and eventually unleash uncontrollable, chaotic counter-energies. These energies, sometimes referred to as ‘backlash’, can have horrifying and unpredictable effects on the unfortunate soul laid vulnerable by overly aggressive or unwise magic. Corruption in this regard strikes the affected most often through physical mutations and afflictions. Horns of varying types have sprouted from the skulls of practicing Wizards, scales appeared on their skin or patches of course beast-like hair. Slit, serpentine or feline pupils have been reported. Fangs and claws can appear, as well as a twisting of the Wizard’s joints to resemble the hind legs of a goat or wolf. However, these cursed blights are not only physical. Often their appearance coincides with other troubling malformations, such as the speech hindered by bleating or growling, a hunger for raw meat or oats, or a stench as of fish or reptiles. Such transformations are attributed to the chaotic reaction the discord of Corruption weaves into all living creatures and specifically those animal in nature. Recovering from these effects requires the subject to free themselves of the negative corruptible charge within. There are many cantrips and charms taught to every Wizard to facilitate this endeavour, each with its own particular mantras and components. These foibles and utterances can often be witnessed immediately after a Wizard’s performance of their art to minimise the accrued charge. Lengthier and more involved examples are necessary when the subject has suffered the effects of backlash and the Wizard seeks to reverse or at least mitigate the effects. Thanks to Richard Grove for authoring this extended article on the effects of corruption in Symbaroum. 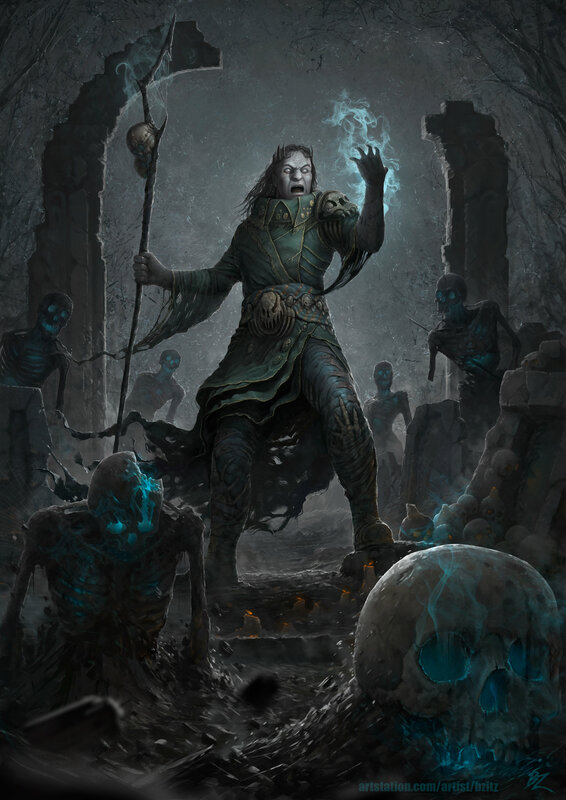 Permission was requested to use the illustration, Necromancer, by Roman Tishenin. Personally, I probably wouldn’t go for mutations for wizards – rather I would go for something like in the previous post where the different paths of Witchcraft had different relationships with Corruption. The main schools of Wizardry that we know of are Pyromancy/Elementalism, Illusionism, and Mentalism – and several of them actually have suggestions for how broken wizards could be. Illusionists are noted as risking becoming trapped in their own dream worlds, or having a constant air of being elsewhere. Mentalists risk shattering their own psyche and fraying their own willpower as they grapple with the implications of their craft. Pyromancers step closer and closer to the element of fire and take on aspects of it, risking their physical shape in the process. The thing all the wizardry schools have in common is that they question, reject, and reach beyond physical perceived reality. The elementalists know that reality is built on pillars of discrete elements that can be summoned and harnessed. Illusionists know that what we perceive is not the true reality and that making things appear real is fairly simple. The mentalists stand somewhere in between the two – looking at the entirety of the world’s physicality, and the place that souls and minds have within it, and recognize that a powerful souls can move everything. A wizard can create the place to stand, and can use their soul as the lever. I like the description of Corruption as static energy, and in this view it would be like a counter-charge that builds up as the wizard pushes to move the earth. And occasionally the lever snaps, and everything comes crashing down. A pyromancer or elementalist might become a node of elemental unbalance, causing flames to flare up or sputter and die in his vicinity, the earth weeping acid where he walks, lighting seeking him like a rod, or water spontaneously freezing after he touches it. He might also take on the classic blight-mark of sulphuric stench, or just a constant smell of burning hair or flesh. He might develop an urge to “nurture” the element of fire to pay for a mystical debt, becoming obsessed with setting fires. An illusionist might develop a difficulty in distinguishing what is real from what he has conjured up from what is in his dreams from what is all in his mind. He might develop fundamental difficulties like prosopagnosia (face blindness) or a haunting noise like tinnitus. He might be haunted by visions of terrible beings he has constructed and now cannot dispel. People who come near him might suffer minor hallucinations or feel claustrophobia or vertigo as if the room they are in has somehow become less real by his presence. When he sleeps, his nightmares might become real – and as a result he might be forced to seek ways to stay awake. A mentalist might have his mind shattered like a pane of glass, separate personalities developing to compartmentalize his terrible knowledge. Objects might behave strangely in his presence, like coins never stopping spinning or dice always landing the same side up. The mentalist might have people following him around as if spellbound, and other people may notice that the wizard never asks for anything or reaches for anything – it’s always one of the people around him handing him things unbidden. I appreciate the lengthy response. It feels a little like lecturers in the academy of the Ordo Magica setting forth competing theories upon the nature of corruption. I’m all a counter-argument!